When: November 2nd, 9th, 16th at 7:00 p.m. 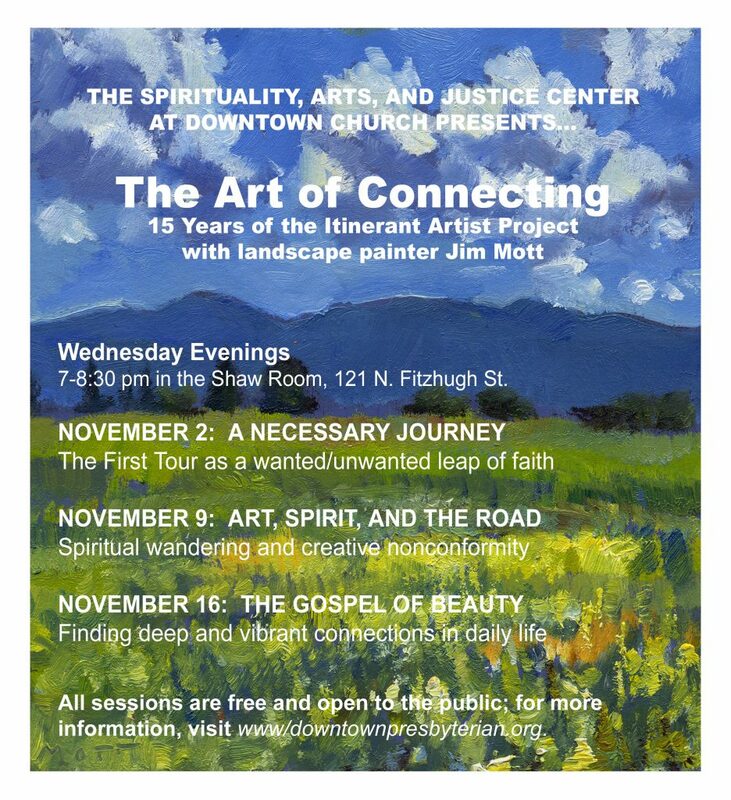 Location: Center for Creativity, Spirituality and Justice, Downtown United Presbyterian Church, Shaw Room (2nd floor), 121 N. Fitzhugh St. The First Tour: cross-country creative odyssey. Spiritual wandering and creative nonconformity. Finding deep connections in everyday life. Please join me for an exhibition of paintings I created on Mount Acuto while staying at the Barnes Artist Residency (2014) and while an artist in residence at the Alfred & Trafford Klots International Program for Artists (2010). The ever talented Cleveland Morris will be showing new Italian Drawings as well. Klos continues to work with interior themes and in a new series, Hypnagogia, he brings the outside in. His 2013 series of 35 plein air paintings portraying the houses of Fort Howard appear in the new interior works. The “house portraits” now fragment and color the underworld interior of a basement studio. The new paintings hover between the realms of abstraction/representation, real/imagined, and direct/indirect modes of painting; they are betwixt and between, capturing the transitional state of moving into a new state of consciousness. Can a still life be a face or even a body? Can a basket of fruit suggest a hillside? Does a single stick of chalk constitute a still life? And does a still life always have to be set upon a table? 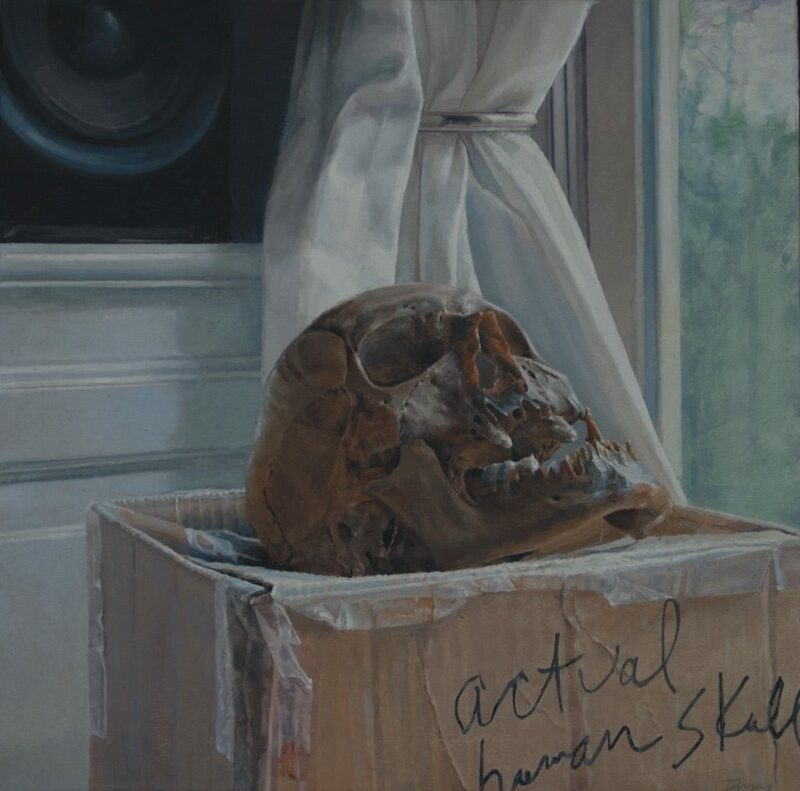 “The Unstilllife” celebrates the eccentric possibilities of still life and is a collection of works by Zeuxis, an association of still life painters that has presented group shows in New York City and around the United States since 1995. Painter Trevor Winkfield, who shows at Tibor de Nagy Gallery in New York and whose highly regarded work as an art writer includes co-founding the journal The Sienese Shredder, is collaborating with Zeuxis to organize the exhibition. 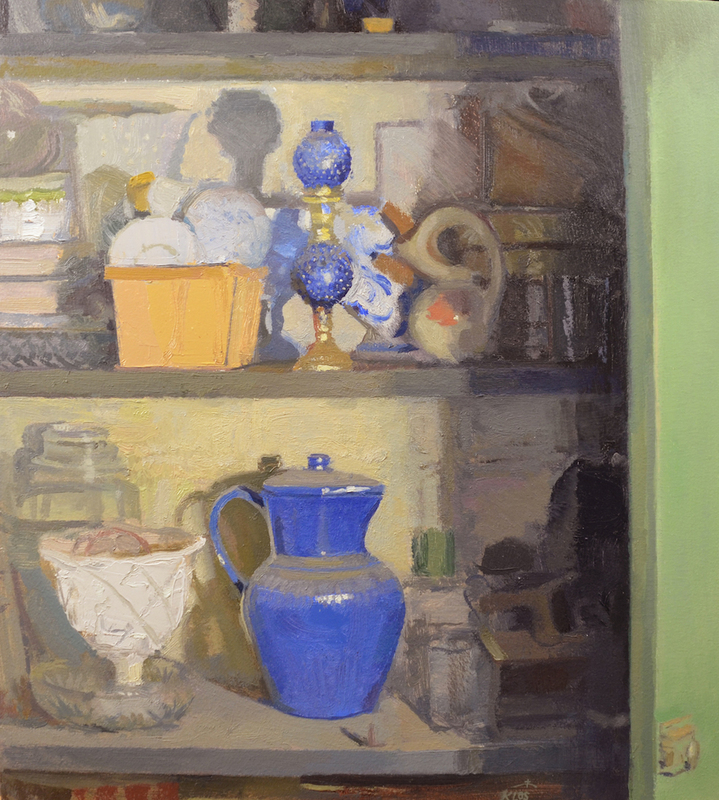 Matt Klos is an Associate Professor of Visual Arts at Anne Arundel Community College, a three time winner of the Maryland State Arts Council Individual Artist Award (2016, 2012, 2008), a winner of the Bethesda Painting Awards (2007), and received an Elizabeth Greenshields Foundation Grant in 2001. Human Skull, Unearthed circa 1930 will be on view in “Concerning the Spiritual,” along with work from around the U.S. as well as Egypt, at the Foundry Art Centre, Satin Charles, Missouri, from Nov. 18 through Jan. 6. This painting has logged more mileage, literally, than almost anything else I’ve done. Its exhibition history is more extensive than most of my paintings, having been included in shows at Manifest, Florida State University Museum of Fine Art, Memorial Art Gallery, and Viridian Artists. Breakfast with Golden Raspberries will be on view at the Marin Museum of Contemporary Art, Novato, California, from Oct. 29 through Dec. 4. 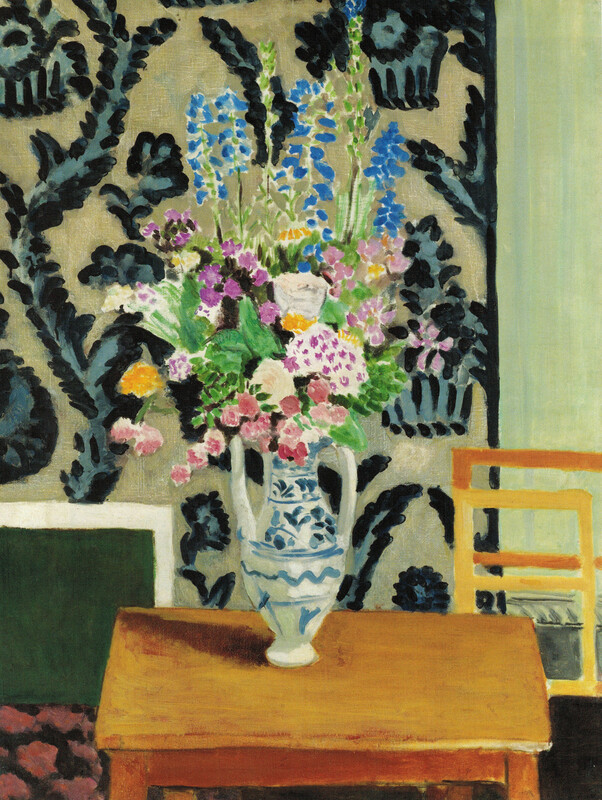 The exhibition was curated by Susan Snyder, co-founder of the Caldwell Snyder Gallery in San Francisco. 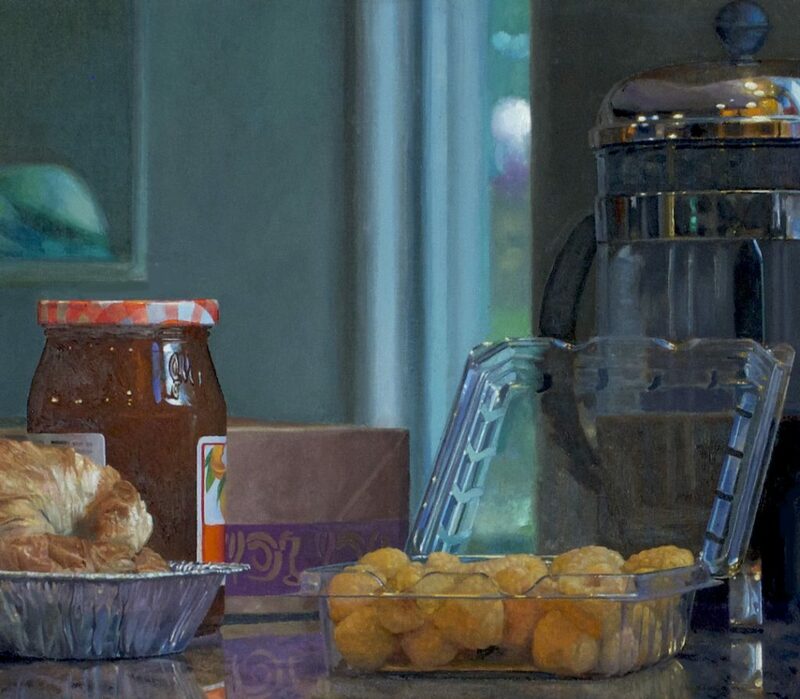 I completed this painting over the summer, after working much longer on it than I had anticipated–but this one required all the stamina and grit I applied to its execution, lingering for quite a while on the clear poly carton for the berries and the coffee maker behind it. I managed to catch some subtle effects of multiple light sources in a way that I haven’t attempted in any other painting. In reality, there were actually ten different sources of light present in this little domestic tableau: three windows and seven artificial lights situated in different places throughout the kitchen. You can see the ceiling lights reflected as little orbs in the stainless steel bands and lid of the French press. And yet with all that light, coming from nearly every direction, some areas of color nearly melt into others because they are tucked away and shielded from most of the direct light. Chevron Bowl will be on view at the 2016 International Juried Exhibition at the Center for Contemporary Arts, in Bedminster, New Jersey, from Nov. 10 through Dec. 23. The exhibition was curated by Jonathan Goodman, an art writer and poet based in New York. He teaches at Pratt Institute in Brooklyn. 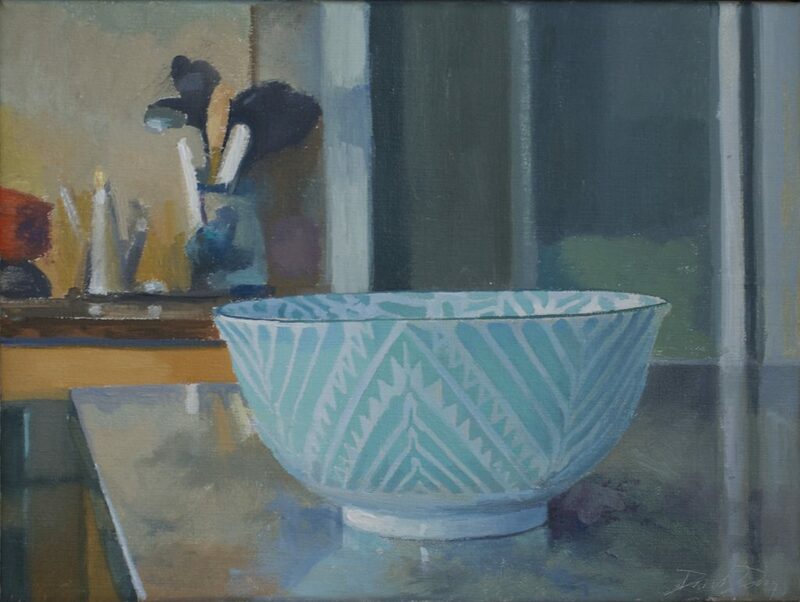 This is one among a series of paintings of patterned bowls I’ve been working on this year with Fairfield Porter in mind. In this series, I’ve been trying to focus less on rendering the image with photographic precision, concentrating more on conveying light and color and pattern with an emphasis on more visible mark-making. I was gratified that this one made it into the show, because I was happier with the results in this painting than in nearly any other painting in the series. I’m going to keep working in this vein, following where it leads, while I also continue to do the sort of images I usually do. The line between this approach and the other is porous and a little unstable–I can start a painting thinking I’m going to be in one mode and find myself migrating into the other–but it’s a distinction that matters to me. What’s been surprising is that things I learn in one approach sometimes open up new modifications in technique in the other approach. Personal cross-pollination. Kayleigh Harris, “Selfie”, detail. 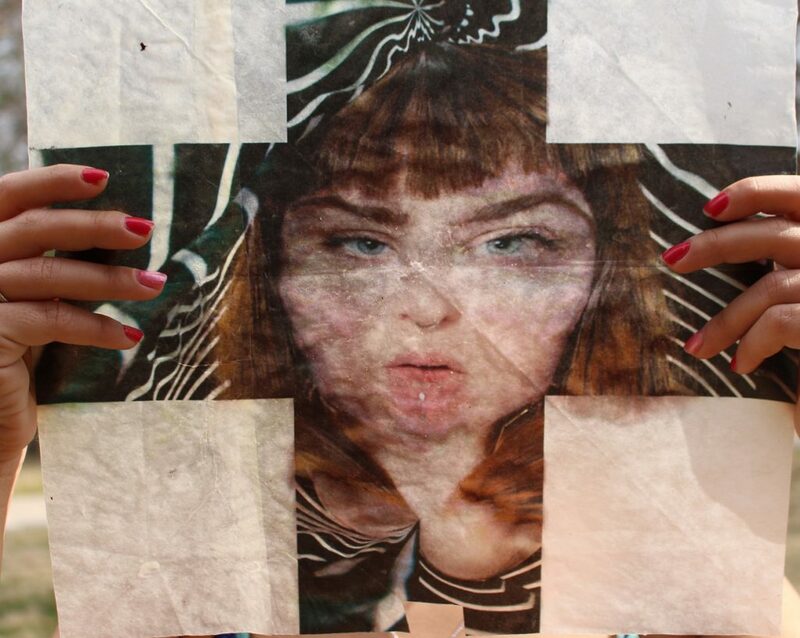 Archival pigment print within pressed wax paper. Portraiture has become something like a new common language. With photography now a nearly daily practice for the average smartphone user, visual imagery is the favored way many people communicate who they are, what they are doing, and where they’re going. In Instagram and Snapchat’s ascendancy over Facebook, younger generations are making what they say subordinate to what they can show. The selfie has become the way people exhibit their place and role in the day-to-day world. FaceTime and Skype have turned telephone calls into face-to-face encounters: a sort of living portraiture. Even when you tap into Uber, up pops the face of the driver who is already on the way. I’ve been having a conversation with Jennifer Wenker, the director of the Herndon Gallery at Antioch College, in which we have been touching on the role of art in human life. She has a show up now, Image: The Public Face, that relates to her deep interest in how art can promote social justice. It’s part of the FotoFocus Biennial in Cincinnati, an area-wide exploration with dozens of institutional participants that examines how photography does and doesn’t document reality and truth, and it has a postmodern twist of calling into question even the basic notions of reality and truth themselves. A central theme of the show is how photography has given power and a voice to people who otherwise wouldn’t have much of either–flattening the hierarchy that once put the painter in control of another person’s self-image and gave the privilege of a portrait to only the rich, powerful, and privileged. The spread of photography first through the invention of the Kodak camera and now through the popularity of the smart phone has thus become a force for social justice. 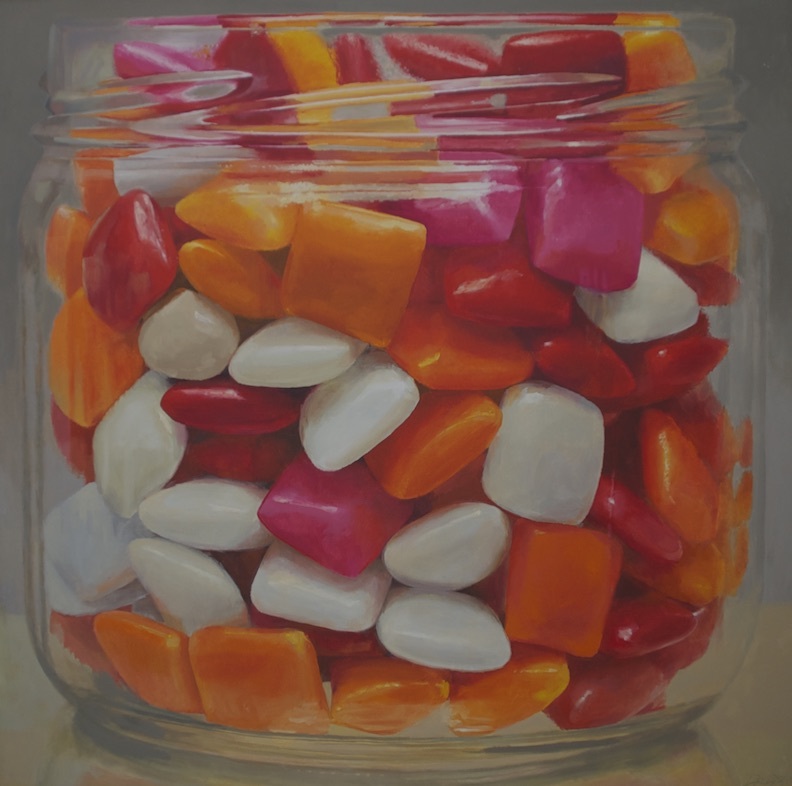 Candy Jar #9 will be on view at The Red Biennial, from Nov. 8 through Dec. 21, in Cambridge, Massachusetts, at the Kathryn Schultz Gallery, 25 Lowell St. The exhibition was curated by Joseph D. Ketner II is the Henry and Lois Foster Chair in Contemporary Art Theory and Practice at Emerson College, Boston. This is one of the series of jars I’ve done and may return to, in a slightly smaller format, next year. You are currently browsing the represent weblog archives for the month October, 2016.